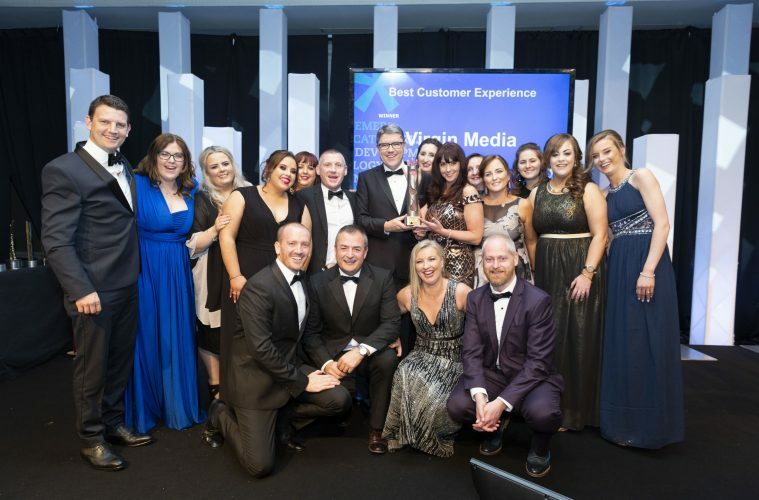 Virgin Media, one of Limerick’s biggest employers, has been recognised as having the ‘Best Customer Experience’ by the Irish Customer Contact and Shared Services Award hosted by CCMA Ireland for the second year in a row at their annual awards ceremony. Virgin Media’s national Customer Experience Centre is based at Roxboro in Limerick and our team supports each customers’ need at all service checkpoints — from sign-up, to detailed tech support, to billing. The CCMA awards celebrate the high standards and service excellence achieved within the Irish contact centre and shared services sector. The Virgin Media team took to the stage to pick up the coveted trophy, beating off tough competition from Laya Healthcare, Paddy Power Betfair, Sky Ireland, New Ireland Assurance and Lilly Global Business Solutions. Virgin Media was singled out for “demonstrating continued outstanding progress in the delivery of customer experience” and the judges were particularly impressed with Virgin Media’s strong customer centric ethos and our single-minded focus to innovate to do things better. “This is a company that values both customer and agent insights to drive continual improvement by implementing many initiatives that have resulted in improved experiences for customers” said the judges. Glen Winn, Head of Revenue Assurance, Fraud & Risk at Virgin Media awarded ‘Industry Professional of the Year – Manager Award’ which highlights his and his team’s successful efforts to reach revenue targets while significantly reducing risks.